I love trying new baking and cooking techniques. Macarons have always been on my “to make list”, but I have to admit that I found macarons intimidating. And honestly, I still sort of do. Let me clarify my intimidation regarding macarons. The techniques necessary to get consistent resulted are based on feel and judgment. The only way to develop those two particular traits is through practice. That brings me to my other main source of intimidation with macarons. They are expensive to make. They shells are made with ground almonds and egg whites. Two expensive ingredients. So if the macarons don’t work out, it’s an expensive mess up. And I really don’t like waste! After conquering those fears, I finally took the plunge. First I tried the French method with very poor results. Thankfully my kids loved them even though they had no feet and many of them cracked. They are the entire batch, so no waste there (thankfully). The second time around I used the Italian method. Yes – it requires an extra step of making a sugar syrup. But the results were so much more consistent. These Mint Macarons are the result of my first go with the Italian method for making macarons. Are my Mint Macarons perfect? Nope, but they came out crack-less with feet! That’s a huge triumph for me. HUGE! 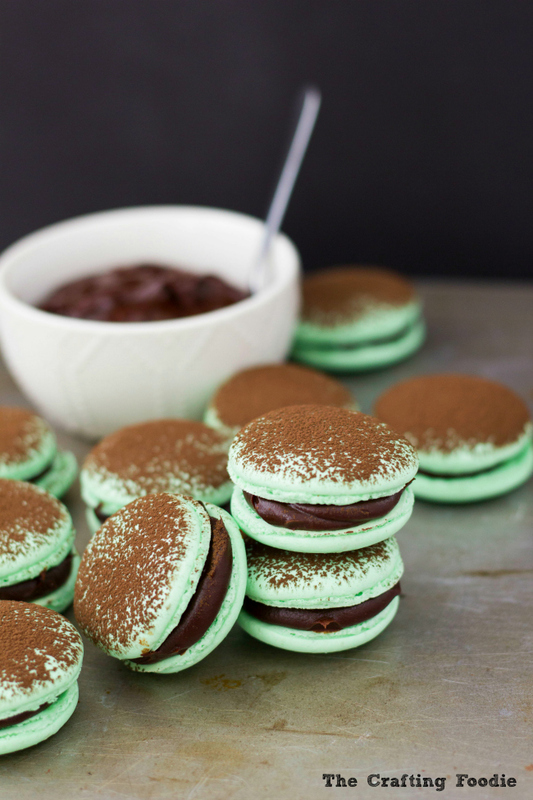 These Mint Macarons are crisp on the outside with a chewy, moist interiors. The Mint Macarons are filled with the mint ganache that gives them a richness and depth of flavor that’s out of this world! The dark chocolate ganache also helps balance the sweetness in the macaron shells. I have to admit that I’m already planning my week to make another batch of macarons. Which ones should I make, orange chocolate or lemon cream? Let me know in the comments below! And check out next week’s post. 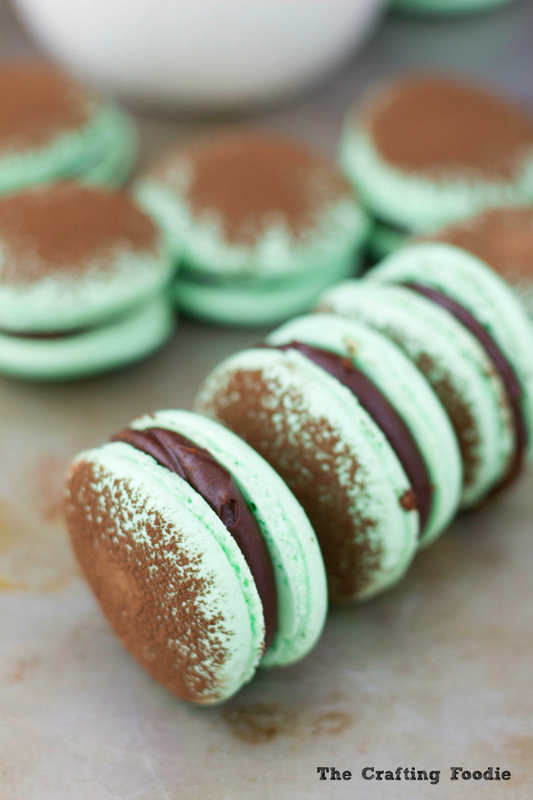 I use these Mint Macarons to make a completely show-stopping, decadent dessert. 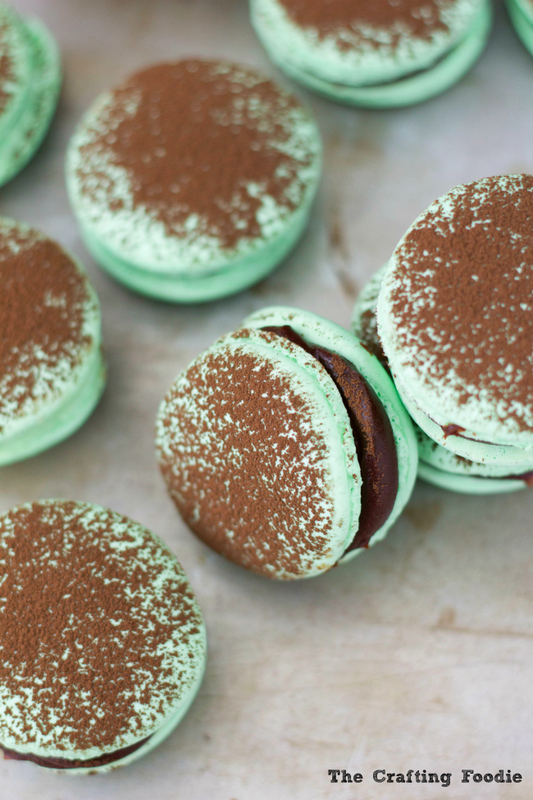 It’s out of this world, and perfect for a sophisticated St. Patrick’s Day treat. Line 3 sheet pans with parchment paper. Trace 1½ inch circles using a cookie cutter or any other round object, on one side of the parchment paper using a pencil. Then flip over the parchment paper (so that the unmarked circles are face down). Whisk the almond meal with the confectioners' sugar. Then sift the almond meal and confectioners' sugar. Continue to sift until there is only about 1 tbs or two of larger clumps left. Make a well in the center of the almond meal and confectioners' sugar. Pour 82 grams of the egg whites in the center. Mix until just combined and a thick paste forms. Set aside. Combined the water and granulated sugar in a small sauce pan. Clip a candy thermometer to the side of the sauce pan. Heat the sugar mixture over medium heat until it reaches about 200 degrees F.
Once the sugar syrup reaches 200 degrees F, place the 90 grams of egg whites in the bowl of a sanding mixer. Add a pinch of granulated sugar. Using a whisk attachment, whip on medium-low speed. Continue to whip until soft peaks form. Once the sugar syrup reaches 248 degrees F, the egg whites should be at the soft peak stage. Increase the mixer to medium, slowly pour the sugar syrup down the side of the mixer bowl. Increase the mixer to medium-high and whip until stiff, glossy peaks form. Add a few drops of gel or powder food color to the mixture. Whip until the color is completely incorporated. Add ⅓ of the whipped egg whites to the almond flour mixture. Fold until just combined. Add the batter to a pastry bag fitted with a large round tip (I used a #10 tip). Place the piped macarons in the oven, and immediately turn the oven temperature down to 225 degrees F.
Bake for 9 to 12 minutes, until the tops are smooth and feet form. Allow the shells to cool on the pan for about 5 minutes. Place the cream and corn syrup in a heavy bottomed sauce pan. Heat over medium-low until the cream simmers. Pour the cream mixture over the chopped chocolate. Cover with an air-tight lid for about 7 to 10 minutes. Mix until a smooth, glossy mixture forms. Add the butter and mint extract. Mix until just combined. Allow the ganache to cool until thick. Place the thickened ganache into a piping bag fitted a large, round tip. 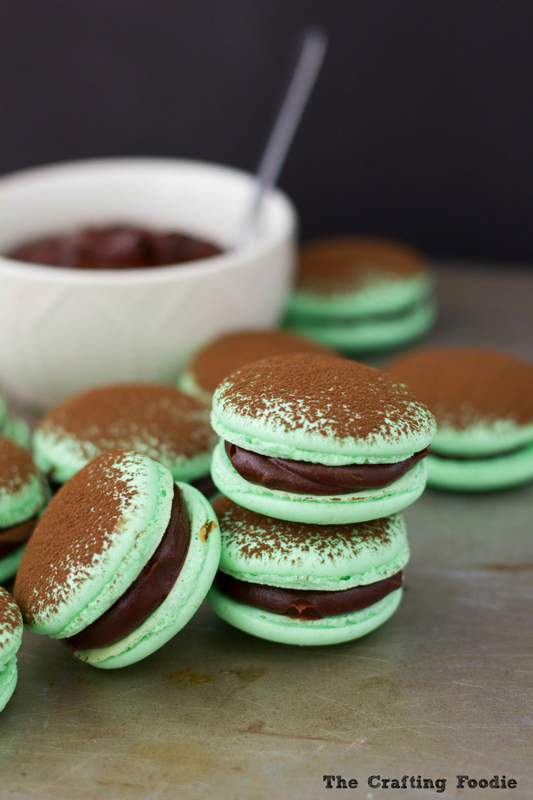 Fill ½ of the macaron shells with the ganache, and sandwich together. Sift cocoa powder over the top of the macarons. Place the macarons in an airtight container and refrigerate. *All of the ingredients must be weighed using a kitchen scale. This recipe is from Thomas Keller's cookbook Bouchon Bakery. These are so cute and I love that bright pop of color! Perfect for the holiday! Lady – these Mint Macarons look pretty darn perfect for me! I’ve not had any luck with them – but maybe with more practice, I’ll have mine looking like these! Wow! I’m just blown away! I love mint chocolate, these are gorgeous! These are so cute! I <3 mint and chocolate together! Good Job! Oh these look decadent! I can’t wait to give this a try, hopefully they come out as great as yours! This looks amazing! I want to eat them. These sound fantastic! I love the dusting of cocoa on the top! Darn it … this looks SOOOO GOOD! haha It’s late at night and that time of the month 🙁 I should not be reading a post like this. It makes me want to go to the grocery store and make some macarons! These are so pretty too 🙂 amazing job! Thank you for the recipe for these. They sound delicious! WOW!! These look like perfection!!! Thank you for sharing I will definitely be trying these out!! These look AMAZING! I haven’t had macarons in forever – these would be so perfect to make for March! I adore a good macaron. I’ve tried to make them, but have had no such luck in them turning out just yet. These look amazing! I love mint and chocolate together, it’s such a great combination. Your macarons came out perfectly! Love the mint and chocolate combo! Perfect for St. Patrick’s Day! I have never tried making macaroons, but you have made them look so appetizing. Thanks for sharing!